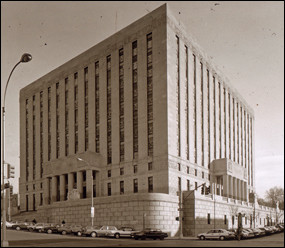 Bounded by the Grand Concourse, East 161st Street, Walton Avenue and East 158th Street, the Bronx County Courthouse houses the Surrogate's Court, Supreme Court, County Clerk, Sheriff, Public Administrator, District Attorney, Bronx Borough President, and other civic agencies. Max Hausel and Joseph H. Freedlander designed this monumental civic edifice, a dominant feature of the Grand Concourse, in a style that combines bold modern massing with no-classic elements. Its massive form is relieved by sleek modern sculpture, both in the round and on friezes which beribbon its walls. Built in 1933 during the Depression at a cost of $8 million, this public project provided sorely needed jobs for the architects, sculptors and various construction workers responsible for its creation. After the site was chosen in 1928, construction began in 1931 and took three and a half years to complete. In 1934, Mayor LaGuardia received a bronze key during the building's three-day dedication and celebration. The steel-framed building, with its granite and limestone facade, has a total floor area of 555,600 square feet. After its construction was complete, the Herald Tribune called the courthouse a prime example of the "Twentieth Century American style", a combination of neoclassical and Modern which was popular in Europe in the 1920s and 30s. The monumental structure rises nine stories over a high-rusticated granite base while the upper windows are set in vertical ribbons with copper and nickel Art Deco style spandrels separated by limestone piers. A large flight of stairs leads to a columned entrance portico, in typical courthouse style. The architects of this historic building were the European trained Joseph Freedlander and Max Hausel, who collaborated on this one venture. Joseph Freedlander (1870-1943) was born in New York and trained at the Massachusetts Institute of Technology and the Ecolé des Beaux Arts in Paris. He designed the neo-Georgian style Museum of the City of New York and the nearby Bronx County House of Detention for Men. Mr. Freedlander was also President of the Fine Arts Federation. Max Hausel was responsible for the design of at least four courthouses in the Bronx. He was born in Switzerland in 1879, where he trained as an architect. After emigrating to the United States in 1897, Mr. Hausel became associated with Michael Garvin, the Bronx architect who designed the Bronx Borough Courthouse in 1905. After Garvin's death in 1918, Hausel designed the Bronx Municipal Courthouse, the Bronx Magistrate's or Traffic Courthouse and the demolished Bronx Family Courthouse at 118 Grand Concourse. His austere classical style has had a major influence on Bronx civic architecture. The Bronx County Courthouse is renowned for the quality and quantity of its sculpture. Charles Keck, who also sculpted figures for Columbia University and the facade of the Brooklyn Museum, designed the frieze above the base. 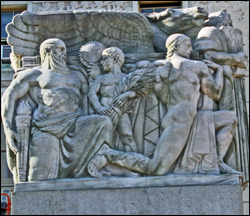 The frieze depicts the activities of the working man with such themes as agriculture, commerce, industry, religion, and the arts. Adolph Weinman, who created the Manhattan Municipal Building facade sculpture, including the Civic Fame statue, supervised the creation of two pink marble sculptural groups at the entrances. Other sculptors included George Snowden, Joseph Kiselewski, and Edward Sandford, Jr. The interior of the building includes arched marble entrances to the lobbies and vaulted elevator lobbies with bronze doors topped by pediments. All of the courtrooms have wood paneling with classical ornament, in a number of different styles and variety of wood types. Bronx County celebrated its twentieth anniversary at the new courthouse when it was opened. To celebrate the occasion, Mayor LaGuardia moved the seat of government from City Hall to the courthouse for three days. The 1939 WPA Guide to New York City stated that it "dominates the entire scene for miles around." Located at the southern end of the Grand Concourse, it covers an entire city block. With its court and City uses, the building has a large number of visitors and is the pivotal structure in the area. The Bronx County Courthouse was designated a New York City Landmark in 1996.  It is also listed on the New York State and National Registers of Historic Places.